About "Calculate conditional relative frequency"
One other type of relative frequency that we can obtain from a two-way frequency table is a conditional relative frequency. A conditional relative frequency is found by dividing a frequency that is not in the Total row or the Total column by the frequency’s row total or column total. A survey is conducted among school students. 50 students are randomly selected and they are asked, whether they prefer dogs, cats or other pets. 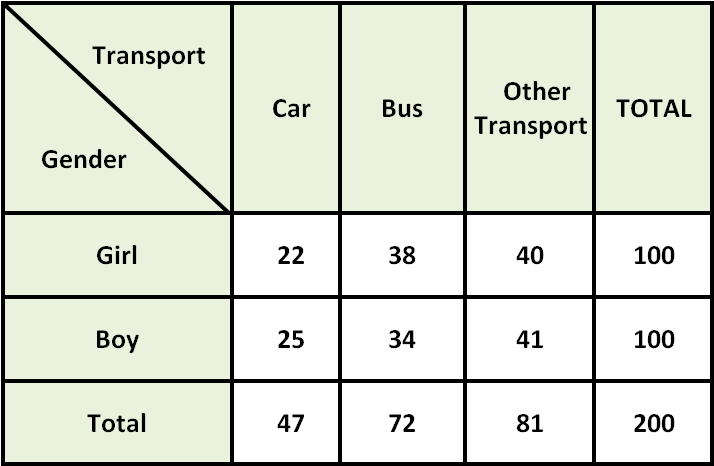 The table given below shows the results of the survey. Use the above table to find each conditional relative frequency. (i) Find the conditional relative frequency that a student surveyed prefers cats as pets, given that the student is a girl. 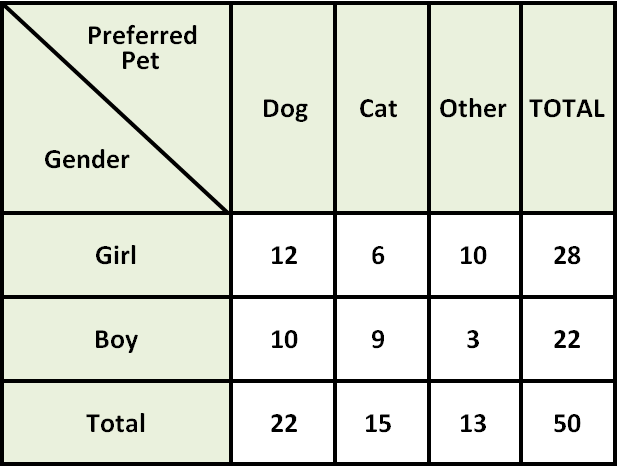 (ii) Find the conditional relative frequency that a student surveyed is a girl, given that the student prefers dog as pets. Divide the number of girls who prefer cats by the number of girls. Express your answer as a decimal and as a percent. Divide the number of girls who prefer dogs by the number of students who prefer dogs. Express your answer as a decimal and as a percent. A survey is made among 100 students in a middle school. They are asked, how they travel to school. The table given below shows the results of the survey. (i) Find the conditional relative frequency that a student surveyed prefers car, given that the student is a boy. (ii) Find the conditional relative frequency that a student surveyed is a boy, given that the student prefers bus. Divide the number of boys who prefer car by the number of boys. Express your answer as a decimal and as a percent. Divide the number of boys who prefer bus by the number of students who prefer bus. Express your answer as a decimal and as a percent. After having gone through the stuff given above, we hope that the students would have understood, "Calculating conditional relative frequency"